I haven't done a regular Wednesday post for two whole weeks due to life kinda getting in the way. I wasn't sure what to write about today, so I was flicking through my stamp album and decided to share these megafauna stamps. I thought I would share them because, basically, they are totally awesome. 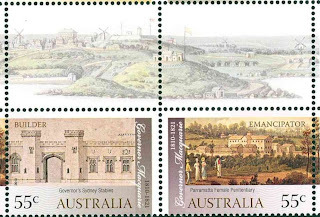 The stamps were released in 2008 for 'stamp collecting month' and as such these stamps are clearly designed to appeal to the primary-school-aged demographic... so I am not sure what it says about me, that I think they are so cool! 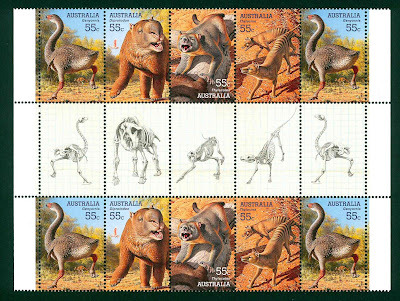 Perhaps the most famous of the animals included on the stamp set is the Thylacine, better known as the Tasmanian Tiger. I didn't know that the Tasmanian Tiger counted as a megafauna, but maybe it had bigger relatives that were megafauna? The poor old Tasmanian Tiger became officially extinct in 1936. 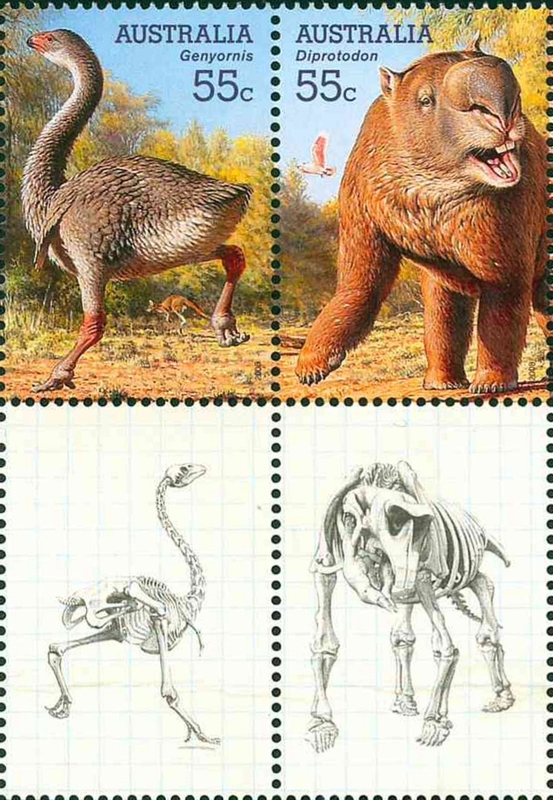 It was extinct on the mainland prior to European contact, but had survived in Tasmania. However, growing up in Gippsland, in south-eastern Victoria, there were rumours circulating about Thylacine sightings. I am not sure of the likelihood of the rumours proving true, but I certainly enjoy the idea of the Tasmanian Tiger surviving. 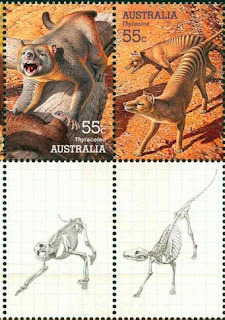 The thing that you will have noticed about these stamps is that they have bonus illustrations in the gutter! I love it when Australia Post has special "gutter strip" releases. I have two other gutter strips that are pretty cool... nothing at all to do with megafauna, and everything to do with just being pretty. I am not going to rabbit on too much about these last two sets - I will just let you admire how pretty they are! 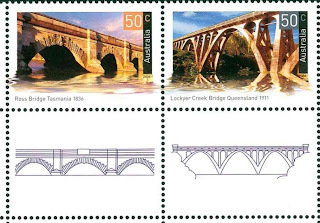 I just love the images chosen for the gutters of all three sets... I love the fossils drawn on graph paper for the mega-fauna series; I love the panorama of Sydney Cove for the release about Governor Macquarie; and I love the design drawings for the bridges stamps. How about that... there is just so much fun to be had in the gutter! 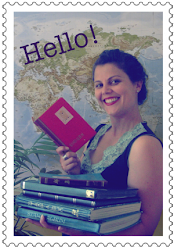 They're amazing really, I didn't really think about how many different types of stamps there are until I started reading your blog. I love it. he he! They are pretty cool, aren't they? I am glad you like them!! oooohhhh, I am glad I scrolled down to read this post as well! 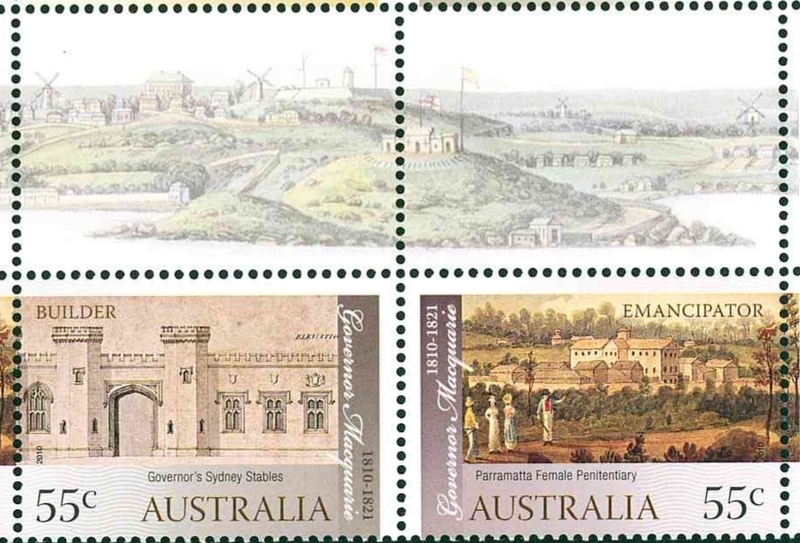 I love the Australia stamps! They are brilliant!